If you happen to be in California during winter months, don't think it twice and stock up on meyer lemons. Trust me, they are worth as much as a walk on Hollywood Hall of Fame or a visit to Beverly Hills. Wikipedia tells us that these lemons are originally from China, where they're used as an ornamental plant, and they were introduced in California in the beginning of last century by Frank Meyer, an employee of the Department of Agriculture, from whom they've gotten their name. I can also tell you that meyer lemons are somewhat in between a lemon and a mandarin, their skin is thinner than common lemons, they are sweet and incredibly scented. Saturday morning my usual trip to the Farmers' Market should have been harmless, but these lemons were all over the place and I couldn't resist. My inner Grandma Duck woke up one more time all of a sudden and she didn't want to listen to reason. Thus, you get this one. A recipe somewhat minimalist, you may say, but quantities depend on the amount and size of lemons. I used 10 of them. Wash lemons, cut off the ends, then cut them in half lenghtwise. Take out the seeds and keep them aside. Cut each lemon half in thin slices, and put them in a large bowl, collecting all the juice they might have released. Barely cover with water and refrigerate overnight. The next day, weight lemon-water mixture and add approximately 70% of the weight in sugar (I've used 1,5 kg o sugar for 2,2 kg. of sugar and water). Wrap the reserved seeds with a piece of cheesecloth, tying it like a small satchel. Add the cheesecloth to a pot along with the fruit, water and sugar, and let it simmer over low-medium heat, skimming if necessary. When the marmalade reaches the right thickness, discard the cheesecloth and pour it in properly cleaned and sterilized glass jars. Close them tightly, put them in a large pot filled with water, and let them boil for 20 minutes. Turn off the heat, and let the jars cool off in the same water to create the vacuum. 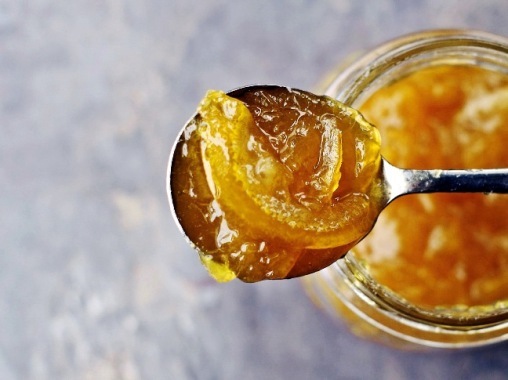 Citrus marmalade, you love it or hate it, there is no grey area here !